Highly detailed as-built building information models enable the highest level of constructability and production control. 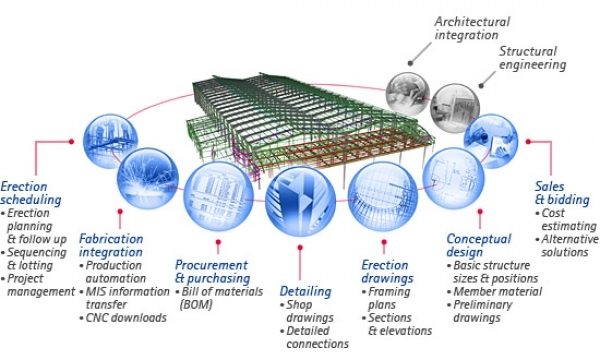 Centralizing model and non-model based data into the Tekla model allows for more collaborative and integrated project management and delivery from conceptual design to construction. The structural steel industry is facing more challenges due to shorter lead times, lack of complete information, problems in revision handling, and a wider need to collaborate with other disciplines. 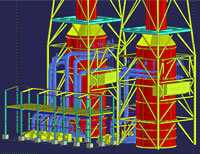 Modeling with Tekla Structures BIM (Building Information Modeling) software is the most advanced and integrated way to detail and fabricate all steel structures, such as commercial buildings, industrial plants, sports stadiums, offshore platforms and jackets including miscellaneous steel work. No other tool on the market supports information management throughout the process; Tekla Structures is a model-based solution to increase productivity through higher automation of fabrication and project management by interfacing with MIS systems and CNC machinery. Tekla Structures enables the most data-rich, highly constructable 3D and 4D structural building information models, and is a significant contrast to current document-based platforms where drawings and reports are distributed and reworked among different organizations. Benefit from intelligent parametric modeling. Enjoy automatic drawing production and reports. Offer clients CNC and MIS data – from model to machines. Participate to BIM workflow when you need.